I’m currently working on a few custom dulcimers and one will feature snakewood binding. Sometimes when I have bought snakewood it has been labeled as lacewood. Both names are descriptive of the figure. The scientific name of what I am using for binding is Brosimum Guianense. Once finish is applied snakewood binding reminds me a bit of the tortoise or celluloid-tortoise binding used on many vintage instruments. Snakewood is beautiful to look at but tricky to work. It is very hard and splinters easily. When using edge tools the figure can easily tear out leaving a pitted surface. I often use a file rather than a scraper when trimming and cleaning up snakewood binding to avoid this. In this photograph I’m planing snakewood binding to a thickness of .090″ prior to bending. 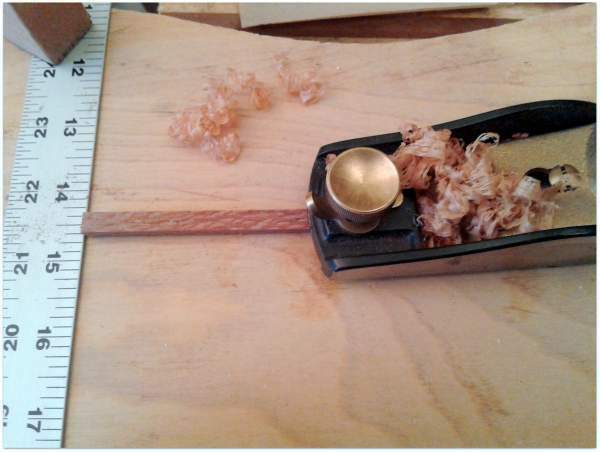 I’m using a low-angle block plane set for a very light cut with a freshly sharpened blade to help prevent tearing out the grain. Snakewood is hard on an edge so I usually end up stropping the blade once or twice before the job is finished. A yardstick clamped across the work board serves as a bench stop. I could just sand the snakewood but this way there is no nasty sawdust and I get to make fine, fluffy shavings. Fine fluffy shavings are fun to make!